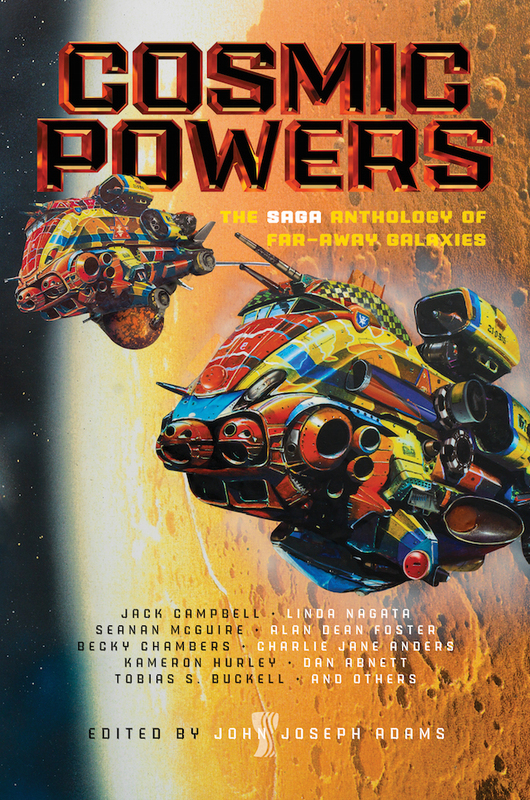 "Warped Passages," by Kameron Hurley [bio] (edited by John Joseph Adams), appeared in Cosmic Powers (RSR review), published on April 18, 2017 by Saga Press. The science is really, really awful. A rocket in space does not stop if you turn the engine off. It coasts. The anomalies make anything disappear that passes into them, except apparently for water and air, but no one seems to notice this. And a sun rises and sets because of a planet’s rotation. It won’t do that if viewed from a spaceship. And the idea of living engines that make rocket fuel chemically is just ridiculous for an interstellar flight. The dialog and narration are both pretty bad, especially toward the end, after Malati’s escape when Jandai explains it all to him/her.